Next walks where anyone with $20 in hand and about four hours to wander the mean streets will be on Sunday July 26 and Sunday August 9. If interested, just show up by noon near the “L” sculpture, ready to go. But there’s no need for a stampede — I figure I’ll do another tour later in August after I get back from PulpFest, and cover at least a couple of the Sundays in September (I’m waiting to hear from someone hauling in from New Zealand about which Sunday in September works best). I’ve already got a Sunday in October penciled into the log book, too. 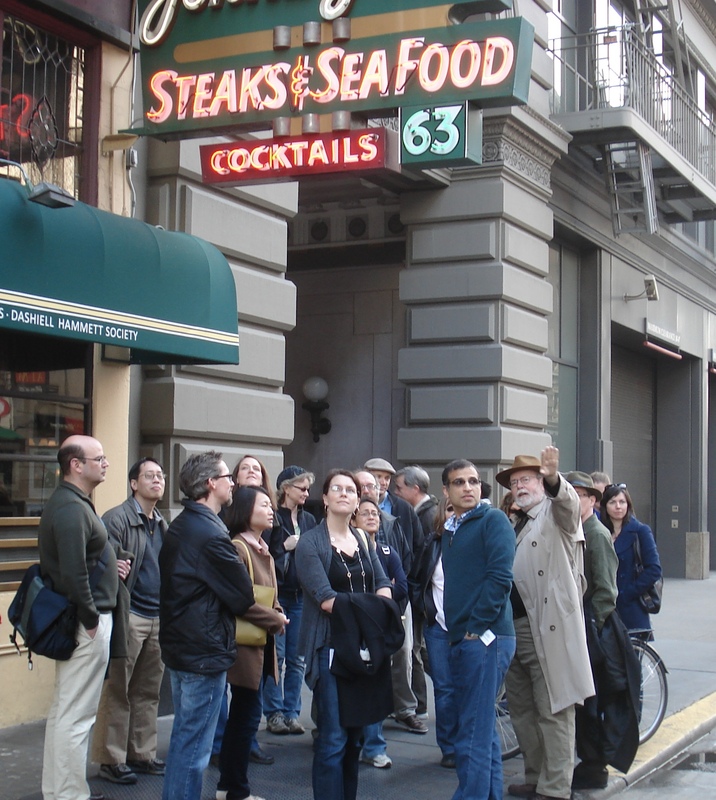 Shot above: Dashiell Hammett Tour in Ellis Street in San Francisco, with the large sign for John’s Grill hanging overhead and the cavernous rear entrance to the Flood Building, where Hammett worked for Pinkerton’s, adjacent. This entry was posted in Tour and tagged Ellis Street, James Flood Building, John's Grill. Bookmark the permalink.